田晓琳, 张赛航, 孔德志, 任雷鸣. 乳鼠及成年大鼠脑皮质膜蛋白差异的分析[J]. 中国药理学通报, 2018, 34(8): 1179-1184. TIAN Xiao-lin, ZHANG Sai-hang, KONG De-zhi, REN Lei-ming. Analysis of difference of cerebral cortex membrane proteins between neonatal and adult rats[J]. Chinese Pharmacological Bulletin, 2018, 34(8): 1179-1184. Abstract: Aim To establish a membrane proteomics method using Novagen ProteoExtract extraction and NanoLC-MS/MS technologies, and to analyze the difference of membrane proteins from cerebral cortex tissue between neonatal and adult rats. 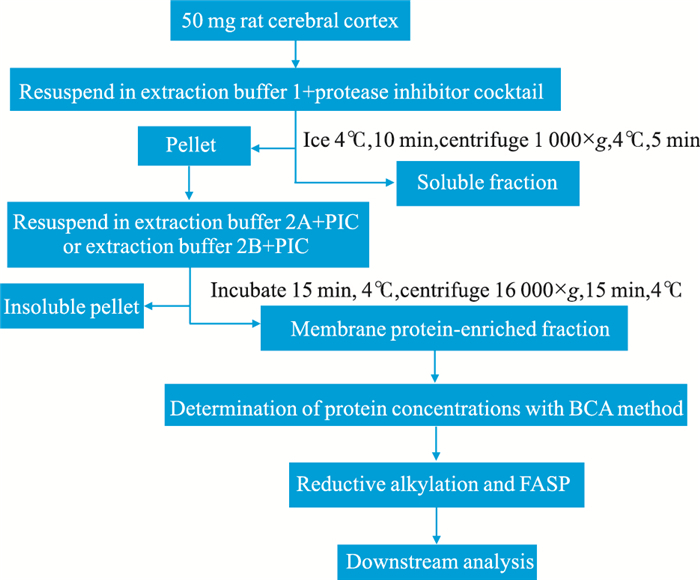 Methods The rat cerebral cortical membrane proteins were extracted by two extract buffers (extraction buffer 2A and extraction buffer 2B) in the Novagen ProteoExtract Transmembrane Protein Extraction Kit (TM-PEK). After enzymatic hydrolysis by the filter aided proteome preparation (FASP) and membrane protein analysis by nano-liquid chromatography coupled with Orbitrap Fusion mass spectrometer, the proteins were identified by Proteome Discover software. The hydrophobicity, transmembrane status and bioinformatics of identified proteins were also analyzed. Results There were 618 hydrophobic proteins (GRAVY value greater than 0) identified by extraction buffer 2B (E2B), and 304/618 proteins had more than one predicted TMDs. 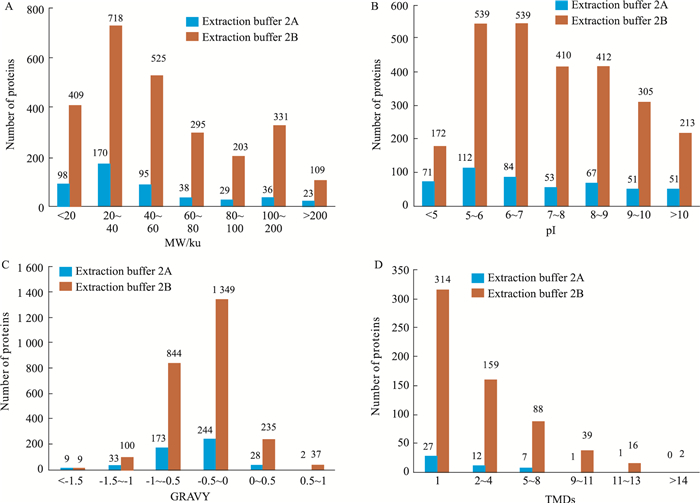 There were only 48 hydrophobic proteins identified by extraction buffer 2A, and 21/48 proteins had more than one predicted TMDs. Gene Ontology analysis showed that the proteins extracted by E2B were significantly enriched in membrane, membrane part and nucleoid. A large amount of synaptic proteins referred to the intercellular interactions were significantly enriched in adult rat, whereas the proteins referred to protein synthesis were much more in neonatal rats than those in adult rats. Conclusions A method based on TM-PEK kit extraction and NanoLC-MS/MS technology has been established to analyze the rat membrane proteins from cerebral cortex tissue. The proteins related to synapses that connect neurons in the brain are much more in adult rats when compared with neonatal ones, whereas the protein synthesis ability is weaker in neonatal rats. 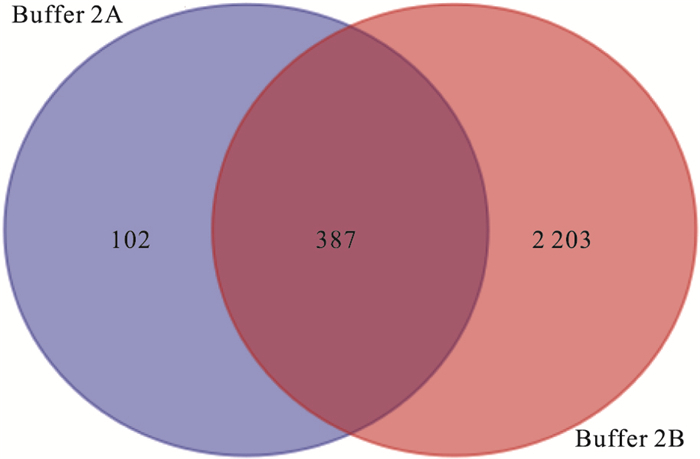 Fig 4 Comparison of distribution of membrane proteins identified based on two different extraction buffers A:Molecular weight (MW); B:Isoelectric point (pI); C:Grand average of hydropathy value (GRAVY); D:Predicted transmembrane domains (TMDs). Fig 5 The GO analysis of cortex membrane proteins in rat cerebral cortex compared between two different extractions A:Cellular component; B:Molecular function; C:Biological processing. 曹莉莎, 张芳, 罗文, 等. 抑郁大鼠海马组织的比较蛋白质组学研究[J]. 中国药理学通报, 2016, 32(5): 697-702. Cao L S, Zhang F, Luo W, et al. Analysis of CUMS-induced differentially expressed proteins in rat hippocampus by ITRAQ[J]. Chin Pharmacol Bull, 2016, 32(5): 697-702. 刘婧媛, 武丽南, 杨元辉, 等. LC-MS/MS法测定家兔血浆中卤米松浓度及其药动学研究[J]. 中国药理学通报, 2017, 33(3): 411-6. Liu J Y, Wu L N, Yang Y H, et al. Determination of halometasone and its pharmacokinetics study in rabbit plasma by LC-MS/MS[J]. Chin Pharmacol Bull, 2017, 33(3): 411-6. Savas J N, Stein B D, Wu C C, et al. Mass spectrometry accelerates membrane protein analysis[J]. Trends Biochemical Sci, 2011, 36(7): 388-96. 刘娟, 朱建航, 范杰平, 等. 去污剂/聚合物双水相体系在膜蛋白分离中的应用[J]. 江西科学, 2008, 26(3): 416-20. Liu J, Zhu J H, Fang J P, et al. Application of detergent/polymer aqueous two phase systems for purification of membrane protein[J]. Jiangxi Sci, 2008, 26(3): 416-20. Chinese Pharmacological Bulletin, 2018, 34(8): 1179-1184.